Hi, there! We just had a fun couple of days with our daughter, Lauren, in Wichita. Lauren and her husband are in the process of buying their first house, so they are excited and scared at the same time! It's a cute 1929 Tudor in the Sleepy Hollow neighborhood. They'll have fun restoring and painting over some questionable wall colors! This is the mixed media card that was in the summer issue of Paper Haus Magazine. She is the very first thing I've drawn all on my own! Kind of like buying a new house (although not so major a thing), it was scary and exciting at the same time! One fun note is that her dress is made from a cupcake liner. If you missed seeing her companion (my second drawing) or would like the link to the summer issue (which includes all the supplies), you can check out THIS post. How about a pretty flower pic? 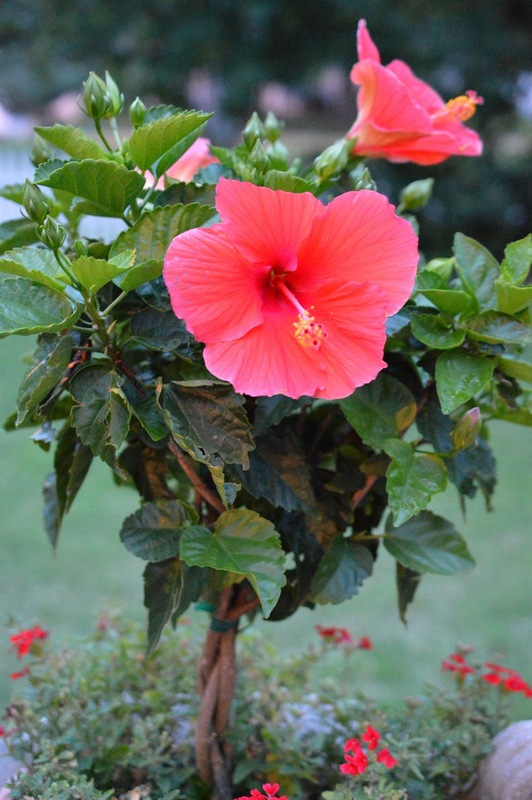 We (and by that I mean Dennis) planted Hibiscus in our urns this year. We had an amazing rain fall the other day, especially for Oklahoma in July, and this picture was taken in the evening after the rain stopped. The flowers almost seem too big for the bush they grow on! So pretty! 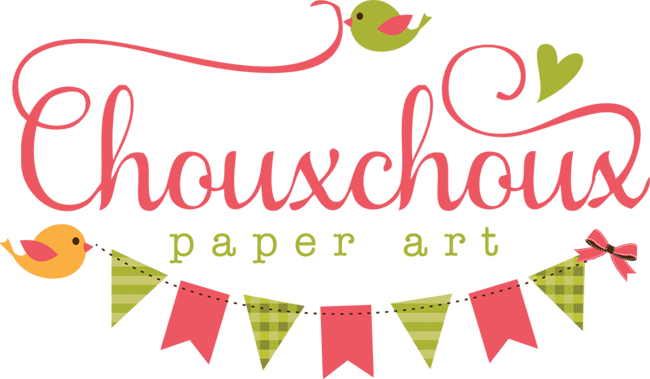 Linking up at Make It Monday. What a cute card my friend. Best of luck to your daughter and there new home. How exciting. That flower looks gorgeous..
Oh Sugar I hope you do more of these mixed media cards - your little girl is precious and you certainly have a talent for this. I love it! What an absolutely adorable illustration and I LOVE that you used cup cake paper for the dress super clever! Thanks for joining us at MIM and good luck. 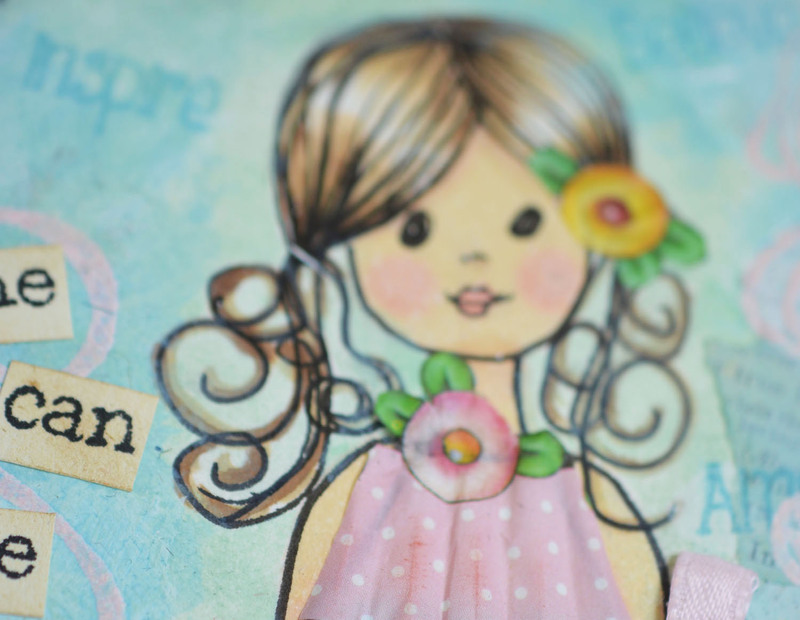 Your mixed media card is simply charming and wonderful! Popped over from MIM. 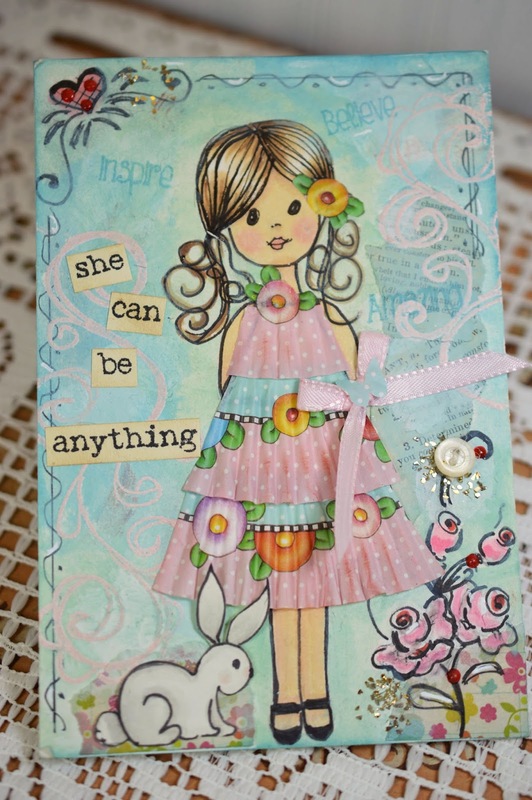 How fabulous your card is Lori, love the girly feel and pretty colours! Please wish Lauren and her husband good luck in their new home, they will love such an old house (we're living in one built in 1918 we love it, of course we sense certain 'things' occasionally, but nothing scary, just happy really). Love your hibiscus flower, these are amongst the finest! Amazing, I can't believe you drew her yourself, great talent. Love how you did the dress from cupcake liners. 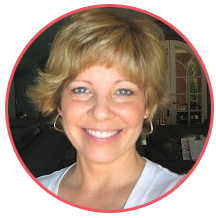 So glad I spotted her on MIM! you are an awesome artist...and gardener!! 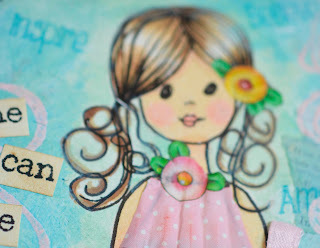 I'll be featuring you this week @ Inspire Me Fridays, thanks so much for sharing your lovely creation! !